OK. I should just be totally embarrassed about this. Right? This is my "art studio". It's very chaotic. And, we're not even talkin' about "controlled chaos". It's just flat out messy. I need a bigger house. I need organization. But at least I'm surrounded by all the things I love: glitter, pretty papers, my old button collection, mags, just old stuff in general, weird finds, thrifted goodies & my 1960's desk lamp that I painted pink with brown polka-dots. 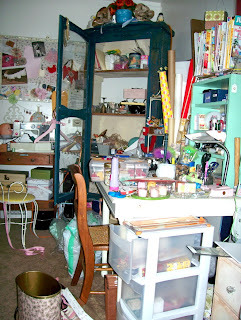 i am glad to know that i am not the only messy crafter on the planet. Wahooo! Love it! looks like my room!LOL! 'cept a little neater 'cause one of my old table collapsed! now we have stacks in one corner. Oh, well. Oh, I can empathise! Check mine out: http://lisaclarke.livejournal.com/#lisaclarke20765 I actually cleaned it up this weekend so I could get a sewing machine and finally learn to sew - woo hoo! My studio space is pretty small. I have to clean up after EVERY project or it is out of control. If you go to my blog and check out my very first blog post back in December you can take a peek at my creative space. One day I'll have a fancy organized one that is more inspiring, but 'til then, I'll love my little messy spot! Jenn, I love that you have all that working space! 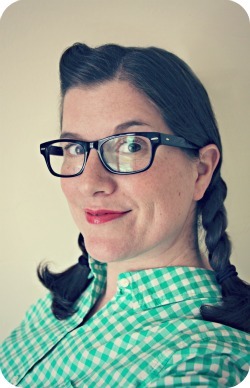 Polka dot, I love the idea of searching through other creative spaces. I think I'll cut-n-paste & make an "art studio dream journal"! Thanks for sharing everyone! I think I'm relieved that I'm not the only one too. It really was a bold step to reveal my space. I feel naked. And FREE!!!! !